We can't NOT read Thanksgiving books around here. 'Tis the season and all. (And you probably need a break from the Christmas fare I've been throwing at you, I'd imagine.) Although I am a huge fan of Christmas, we are quite excited about Thanksgiving also. As I mentioned, I had wanted to read Growing Grateful Kids : Teaching Them to Appreciate an Extraordinary God in Ordinary Places as we entered into the holiday season and I am, in fact, doing that right now. (Finally.) We do have some Thanksgiving titles around here but I wanted to highlight particular books we are reading in conjunction with the holiday books which might not discuss the history of the day but focus on the idea of being thankful for what have, content with where we are, and grateful for the things God has done for us. If you haven't read The Best Nest why you just oughta, that's what! This book tells the story of Mr. and Mrs. Bird. Mrs. Bird is discontent with their bird house and wants to go and find another place to build a nest. Mr. Bird doesn't see anything wrong with where they are at, but goes along with his wife's plan at her insistence. She finally decides that the Best Nest has been located only to discover that looks aren't always what they seem. The two birds discover that their original home truly was the best one for them and Mrs. Bird learns to be content in it. So many lessons can be drawn from this particular story and I don't think they need a whole lot of spelling out either. You get the idea. 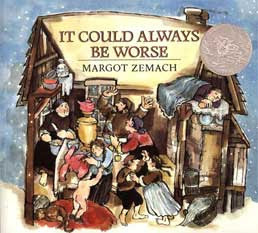 It Could Always Be Worse is a Yiddish folk tale and also holds the distinction of being a Caldecott winner. It tells the story of a "poor unfortunate man" who shares a small one room house with his mother, his wife and his six children. (I think most of us would agree that this could be a rather unpleasant situation!) The poor unfortunate man goes to his Rabbi and asks for advice. The Rabbi counsels him to start bringing in his barnyard animals and the man takes the Rabbi's advice, despite being confused by it. The situation inside the home worsens until finally the Rabbi advises the man to remove all of the animals. The man gratefully kicks all of the animals out of the house and discovers that there actually is plenty of room to live peaceably with all of his relatives. Situations COULD always be worse. We should learn to be grateful for what they are and make the best of them, no?! 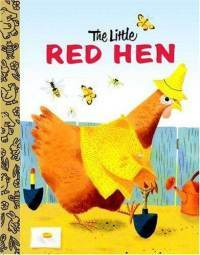 What mother among you doesn't relish the opportunity to read The Little Red Hen to her children? Truth be told, I think this book should not only be read to children but to many, um, adults as well. We're reading this one and focusing on the idea that we should not only be grateful for the work that others do on our behalf but we should also be hard workers ourselves so that we learn to value that which we own to a greater extent. I could insert a little sermon here but I'll forcefully refrain myself and move on. Yes, yes, you're welcome. 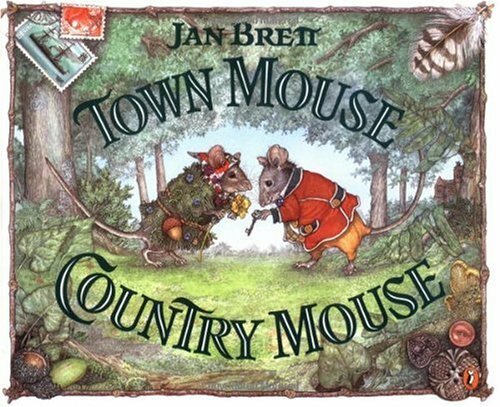 Town Mouse, Country Mouse , illustrated by Jan Brett. This is another age old tale which has a moral that rather explains itself. It is another book containing a lesson about contentment. 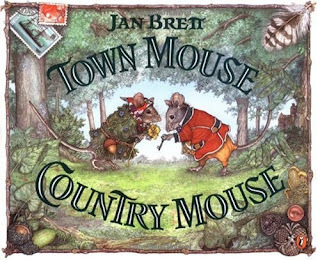 Jan Brett's illustrations make this story even more delightful and we're very happy reading it. Again, I realize that none of these books are specifically Thanksgiving related, however, they do present good lessons on gratefulness and contentment and for that I very much like them. If you are looking for specific Thanksgiving titles, I recommend you hop on over to Stephanie's Mommy Brain as she is focusing on the Thanksgiving holiday specifically this month. She has talked about Kid's Thanksgiving Activities, making a Thanksgiving journal, and has naturally offered up some Thanksgiving picture book suggestions as well. I'm sure you'll find some rather creative ideas over on her site if you'd like to check that out! In the meantime, if you have any specific picture books that you and your family really love to read during the month of November which focus on either the holiday itself or contain a message of gratefulness, I'd really love to hear about them! I'm still building our home collection and will take any and all suggestions. I love this idea of focusing on books about gratitude and thankfulness instead of just the usual Pilgrim fare. Great idea! 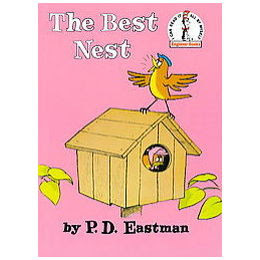 My Nest is Best is a true classic - I remember that from my childhood. I love, love, LOVE this post and am absolutely going to make a point to read some of these titles with my kiddos and talk about showing gratefulness. Thanks for sharing! !